This is an old-school type of game where a player has to overcome different level challenges. In this level, we see that there are incoming darts that can be avoided by dodging or jumping over them. On the right side, there are guns that shoot lasers simultaneously, the player needs to use his intellect to avoid these lasers. In addition, there is a challenge of jumping from one platform to another to avoid death by falling. 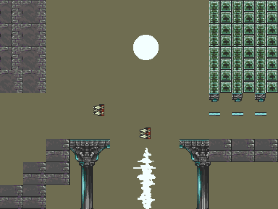 Of course, the player will be using a character who’s not in shown in this level design.